Apart from acting as a virtual gathering space Social Media software platforms quickly learned that their communities want to create content, and the faster the better. I built this blog post with the WordPress ‘QuickPress’ user interface and have looked at others including Posterous and Livejournal though WordPress is the most comfortable so far I have just downloaded Typo3 and will look at it over the next week or two. My sense is that all of the Social Media software sites provide the content creation tools in an attempt to keep their ‘community’ close and members are critical to the valuation of software platforms and ultimately critical to the exit strategy of the founders and venture capitalists who fund them. The connection between content creation software, a content arms race, a good ‘valuation’ and selling for maximum profit is astraight line and clear as a bell. With all of the content creation systems out there and not enough time in the day a simple question surfaces quickly, why do Social Media software users blog? This question has many answers that include convenience, attention, entertainment, though the biggest reason may be that since early 2009 or late 2008 over half of searches started in Social Media software platforms. Almost everyone covets a top rank on a Google or BING or Yahoo search engine results page or SERP as #1 means profit. People look there and depend on the information there to make a buying decision and typically jump from top ranked links to a purchase transaction. If they buy something after visiting your top ranked site you earn a commission, Amazon (or other resellers) earn a commission and the manufacturer earns less as they pay the commissions. Backlinks are a form of voting where you benefit from the content of internet users who then mention and link to your site. Backlinks may be created by posting good quality content to blogs with links to your site and you may see contrived posts that are note humanly readable with links. Google “SpeedSynch” and you will see what looks like sites with a photography conversation that seem to reference all types of variations of “speedsynch” or “speed synch” or “speedsync”. While the blog posts appear to use industry specific jargon, let me assure you that no one would ever string a sentence together in that fasshion. Now unless you blog then the ‘photographer’ sites rise to the top of Google and they get the ‘searchers’ looking for SpeedSynch.com. While this would have made a huge difference five years ago, over the past three years it means much less and since last year it means not much at all. Most of the traffic to SpeedSynch.com comes from Social Media sites and searches related to SpeedSynch.com focus on specific comments, SEO Reports, answers on how SpeedSynch internet marketing software creates semantic resonance maps, the same resonance championed by Twitter, or how SpeedSynch internet marketing techniques may be applied to competitive analysis or to deliver fast learning to self-directed adult learners. The ‘photography’ blogs the posts include links which battle for the #1 spot when anyone searches for ‘speedsynch’. Try searching on any brand that pops into your mind and find out who stands between you and the brand that you wish to find. The correlation between rank, content and links is pretty straight forward and generally known. Creating new content faster appears to be necessary in order to rank higher to get more profit or attention. The process of ‘improving’ page rank is called search engine optimization and consultants will show you how to rank higher or will do the work for you. The work, because of the nature of search engines, involved content backlinks and directly or indirectly depends on content creation. The relationship between searchers and content used to be simple, both were performed in the Google software interface or search engine box. Social Media has since enticed over half of searchers to start in their platforms and so Google’s ‘search share’ may be less than 35% given the numbers and other search competitors. Indeed this trend may have been the driver for Microsoft’s significant Facebook investment a few years ago–the writing was on the wall, SEO was going down. Google has fought back to protect the concept of SEO by innovating and corporations like Amazon also stand to lose large if SEO deteriorates as ‘affiliate marketing’ represents a large portion of their revenues. The more SEO ‘crews’ that stand between you and brand owners the more transactions go to Amazon or similar re-sellers. If manufacturers could estabilish a direct relationship then their profits and possibly your cost would go down too. On the innovation side, Google may actually speed up the decline of SEO with Android. After all how many links on a page will searchers view? Likewise the Google ‘Instant’ feature appears to ‘guide’ searchers past the ‘links’ that might have distracted them right to the big brands. All the work of the SEO ‘crews’ may have been spoiled. Semantic SEO or semantic algorithms introduced and soon to be augmented by Googles’ purchase of Metaweb will take searchers away from viewing pages even faster. Twitter is the fourth horseman of SEO’s apocolypse as Twitter doesn’t even rely on conventional backlinks. Twitter is the future of marketing from our perspective and accelerates SEO’s decline further. SEO appears to be failing Google just as Social Media is rising in popularity and this is because of the huge amound to content that millions of people can generate. But do people have time to fight content wars? Yes and no. Posterous and WordPress’ QuickPress, where this post is being created, helps people quickly generate and distribute content–more bad news for Google as if I was the corporate advertiser with the big budget I would ask hard questions about why I shouldn’t just create my own content in the spaces where people gather. Why do I need a broker when Social Media is where the action is? WordPress has ramped up their content creation capabilities as it rushes to its exit strategy, just like all of the other Social Media platforms. Now lets see what Google does next. Resonance is an important factor in internet marketing and inspires and drives Twitter’s advertising business model. Resonance is a similar focus or purpose or interest and often it can be measured easily by understanding the stories active or top of mind for people or content. On simple way to determine an affinity of resonance in people, objects, places, spaces, events or time is to assess the similarity and differences in perspectives or stories. While this is evident when looking at resonance between two people, except for the case of different perspectives which we will address later, how does this work when you compare perspectives of people and objects? One simple way to understand how people can resonate with objects is to define the object a product being offered for sale. Products are concieved as an idea, designed, manufactured and taken to product and in most importantly, wrapped in stories to convey learning about the value of the product to future customers, how to deliver or repair the product and how the product should be made in order to deliver value to its buyer and profit to its seller and manufacturer. Products resonate according to the stories in which they are wrapped as they proceed and mature from an idea to delivering value to a buyer. Once we know the perspectives or stories important in relationships then we can employ content to increase or decrease resonance. Yes, it is true, sometimes you want to push things apart as in slowing down demand for a product that we won`t be able to deliver until next month or next quarter or perhaps is not as profitable or where we have a temporary quality issue. Content has two unique values and is more than a story or image or brand as it may be used to convey learning, it may be used to help people find things and also be created as a product as is the case with publishers or a wayfinding tool as is the case with search engines or street maps. The form that content takes depends on its use and its use depends on where content is valuable. When content is used as a wayfinding or navigation tool, such as in search engine optimization or SEO, content is usually crafted to attract the attention of search engine spiders to specific website pages or other content which has product value. The wayfinding content must resonate with both search engine spiders and searchers or people find it and use it to visually navigate to the space where they find answers to their questions or to help them refine their questions according to new perspectives encountered. It is the wayfinding value of content that must resonate with people and while wayfinding content is valued highly, look at Google’s stock value, it must also be changed constantly as searchers use different words and perspectives to describe similar problems on a regular basis. Indeed the way searchers describe virtually identical perspectives changes about 30% per month so that in less than three months any product description must be modified according to ‘old school’ search engine optimization methods. Ask yourself how you describe something you need today and observe how this changes constantly and while 30% may seem high it is still significant even if the number was 10% or less and this is one of the reasons why Google, Yahoo and BING are moving quickly to semantic SEO where different descriptions of a problem will yield similar or different search engine results depending on the user context or perspective. Content must change to accomodate changing customer perspectives, questions, problems or objectives as needs and markets never stand still, they always change. This is one aspect of resonance and the way we describe out products and where we deliver content to attract searchers or customers to our products or content is the other aspect of resonance inspired content. Social Media software platforms like WordPress, LinkedIn, Facebook and other provide a space for ordinary people to create their own content and compete with marketers and advertisers who are served by search engine corporations. Today if you post enough blog content you can influence which links are presented to searchers by search engines. Content quantity now rules quality and the value created by advertisers is temporary as it may be disrupted at any time by Social Media bloggers who create a ‘stronger path’ to links unreleated to the products or their brand owners regardless of how much money they spent to create those relationships. If the idea that quantity of advertising or promotion trumps quality leaves a bad taste in your mouth then consider the poor advertising agencies who in the past four or five years have been swamped by Public Relations firms or advertisers that shout the same message many times–not exactly a quality focus though some ads are good. Advertising and promotion on the internet is no longer even remotely additive which implies that the revenue and advertising models that up to late 2008 favoured search engine optimization or SEO have eroded quickly and there are opportunities in finding their replacements. If since late 2008 or early 2009 over half of all internet searches started in Social Media platforms and posting enough blog content will impact positively on your search engine results ranking or negatively impact your competitors then why do corporations still believe in the concept of search engine optimization? May advertisers will go with strength and re-focus marketing investments to divert advertising programs and events from a SEO orientation to focus squarely on Social Media. May marketers intuitively undersand the rise of social media though they continue to stick with applying the concept of branding to a platform that naturally embraces NAMING. What is naming? We view naming as something beyond the selection of a name as different people may apply more than one name to the same thing as they view it from at least two different perspectives. HOT to one person is POPULAR to another and SICK to someone else–note that here SICK may actually mean someone is ILL or mean that something is emphatically GREAT in regional slang. You too can understand which names are important in your communities and to your customers by looking at their stories and how their stories RESONATE to attract people to content which in turn directs them to products or provides answers to questions important to searchers or customers. It is imporatant to note that content in Twitter, Social Media blogs and corporate web sites all change or resonante differently and when looking at the competitive analysis exemplar below we may direct some customers to Twitter, others to our Social Media blogs and others to our corporate site. The determination of where we direct our customers depends on there interaction preferences and the closeness of NAMES in the three locations so that we align closely and carefully to customer names used. Let’s start by understanding how our content resonates. We determine how ‘people’ resonate with the same approach by looking at the content they post and the names they use to describe their questions or problems and answers or solutions they seek. Note different themes on the Twitter feed of SpeedSynch.com and the Resonance map of SpeedSynch.com below. 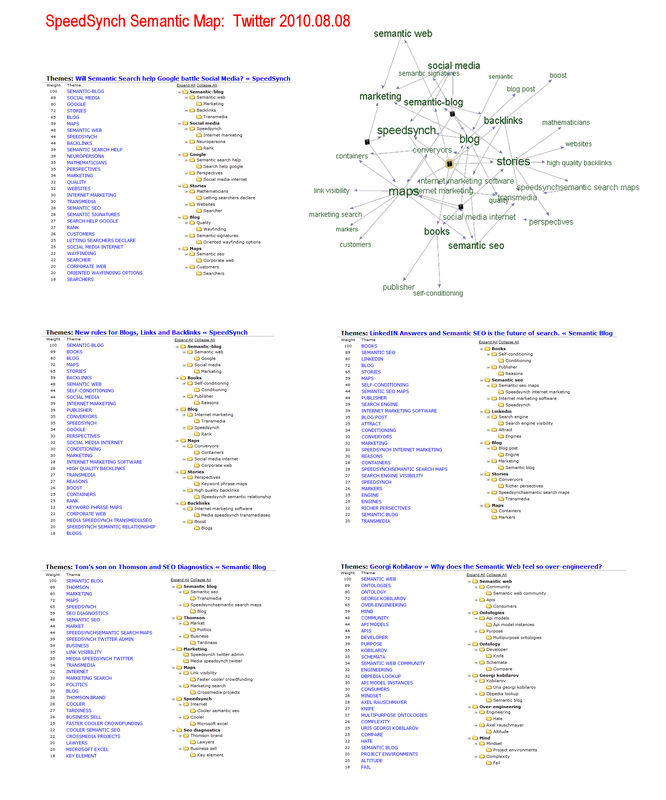 We clearly see the SpeedSynch Twitter shift by looking at the semantic differences to the web site Resonance map above. While this may seem like a controversial statement, in my experience names rule and trump brands in Social Media internet marketing and the sooner you assess if this is true for your company or brand the bigger advantage you will have to create new and unique value for your customers. As a social media giant Twitter has already impacted the future of Internet Marketing and the tools used in the craft. To understand the impact and value of Twitter’s Resonance advertising model to internet marketers we must take a look at search engine optimization or SEO. Ironically marketing executives have unknowingly and implicitly placed their trust into the hands of keyword ranking reports to guide the future of their brands and products without knowing the impact of search engine optimization or SEO metrics on investment ROI. The promise of SEO is intoxicating, it simplifies the lives of over stressed internet marketers, is very simple to measure and the defacto SEO metric measure of success has become search engine page rank, Google’s or Yahoo’s or BING’s. You’ve put your trust in an algorithmic black box. To SEO marketers the justification for using page rank is simple. Buyers of your products or services are attached to the internet and use their finger tips to explore purchasing options by constantly typing in their needs into a search engine. Of course they don’t quite say it this way but as you peel back the statistics and behavioural profiles of buyers, sellers and the correlation between search and internet buying behaviours you end at page rank. The healthcare industry should take note as it could easily show the correlation between blood pressure or heart rate and a successful purchase outcome related to search engine behaviour to internet marketers. This link might well result in a renaissance of drug research and boost sales of drug manufacturers well into the next century. Let’s explore some SEO assumptions and search engine keyword rank might affect you. Marketing professionals use measures to determine the success of their efforts or return on investments, ROI. SEO vendors justify the investment in their services the same way. Will an SEO program generating qualified traffic to the site? Is the SEO effort generating phone calls? Is the SEO effort delivering a solid ROI? When you invest in a SEO campaign it is tempting to attribute new leads, phone calls and sales to the SEO effort and the tendency is stronger as you invest more. To avoid this tendency we suggest that companies view SEO as a part of an integrated marketing effort and measure it accordingly. Start small and see if any time or money should be devoted to SEO. There are very many SEO success stories where monthly expenditures are less than $1,000 for large corporations and less that $100 for mid-size or small companies. Marketers have two SEO options; they can pay consultants or pay search engines. You will find millions of words to justify the differences and nuances of value between the two but it would be much faster to call Yahoo, BING or Google directly and then call the ‘organic’ SEO vendors. The size of the SEO reports you receive may vary according to the amount of money you spend. That is not to say that your SEO vendor shouldn’t be delivering reports, but the question is whether they justify the work delivered or whether their focus is on the objective of the marketing campaign. Since outside vendors are often excluded from the larger marketing tactical and strategic picture the reports should be very thin and the real assessment should be made with internal reports that blend measurable results with on-going marketing efforts. By its nature SEO can only focus on keywords and we must assume that you have placed a considerable amount of trust that your ability to influence the keywords that are returned in a search engine results page or SERP are directly correlated to more traffic for your internet sites and then highly correlated to incremental sales for your brands or products. SEO vendors often avoid hard questions about the correlation of SEO to sales because it is hard to prove in the past or guarantee in the future. Marketers have the same problem with their investments and this ambiguity and risk is normal in business, stressful as it may be. However, the focus of most SEO efforts must be understood if they are to be assessed for ROI returns correctly and improved over time. SEO vendors focus on competitors and keywords. SEO vendors look to competitors’ products and web sites to determine if any of their keywords are important to you. If they are they immediately focus on tactics to ‘dominate’ the keyword, which means that after a ‘successful’ SEO program when any searcher enters that keyword combination into a search engine your brands of products will show up higher than your competitors. End of story. The rest is up to the searcher and luck. Of course there are millions of words that are on the internet as to how difficult this is to accomplish, assuming that this result will help you, and the different ways to ‘dominate’ keywords to your benefit. There are many reasons to avoid this type of reasoning and ways to save considerable time and money while still benefiting from some SEO expenditures. Since late 2008 most internet searches or rather the place where people have started their search for information or a product or service is a Social Media software platform–Twitter, LinkedIN, YouTube, Facebook and seemingly millions of Word Press blogs. SEO is focused on search and search engine results pages and is much less effective in the Social Media islands. The people with advanced SEO skills stand between you and the search engines and the product manufacturers that they serve, they are not who talk to you about SEO programs and to see who they are enter “cordless drill” into the search engine of your choice and open up the first 10 links. The probability is that Amazon and Wikipedia will be in the top 10 and the rest will be SEO crews who step in between the product manufacturers and you. If large multi-billion dollar corporations can’t do better than this, how can you? This is the first of a two part look at Twitter and the future of internet marketing tools. Twitter has recently announced its Resonance advertising model and taking it to market initially in the form of promoted Tweets. In part two we will look at the opportunities Resonance present internet marketing professionals as some practical tools and tips to get the resonance you need. Nick Trendov is the Producer of SpeedSynch internet marketing software. 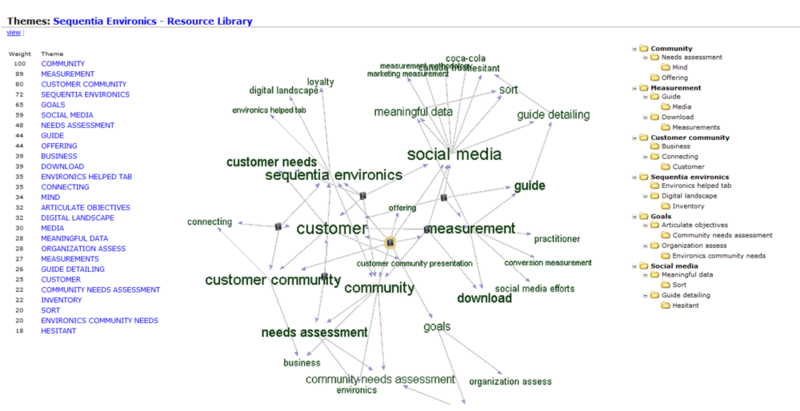 SpeedSynch software employs Semantic meaning to map content relationships internally and externally from a corporate perspective and in mid-September will host five corporations in a working group to evaluate Resonance based customer profiles. Twitter has stepped up to introduce Resonance as the driver of its advertising model and the an alternative to the eroding value of SEO and PP or pay per click advertising.